Rock Band 3 will, as expected, let you do something you've never been able to do in a Rock Band (or Guitar Hero) game before: play the keyboard. Yes, the fifth wheel of the rock world makes its long-overdue debut in Harmonix's Rock Band 3, a report on USA Today showcasing not only the new controller in action, but a revamped tracklist designed to make the most of it. 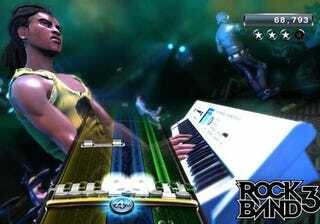 The keyboard is a "25-key, fully functioning MIDI" version of the real thing, and is one of two key improvements made to the game, the other being the introduction of a new "Rock Band Pro" mode for expert players, which replaces coloured tabs with real musical symbols in an effort to get players on the track to playing real instruments. To complement Pro mode, there are two new guitar controllers in development that feature actual strings, one a full-sized replica of a Fender Stratocaster, the other a Fender Mustang Pro. "You can go from plucking single notes to power chords and bar chords, we have crazy stuff like tapping and slides," Harmonix's Sylvain Dubrofsky says. "If you ever had any aspirations of connecting with the music in a deeper way ... you are really going to like Rock Band 3." A partial tracklist has also been revealed, and is predictably keyboard-heavy. There are plenty of other minor tweaks and adjustments being made to the series' successful formula, which you can check out at the USA Today report below.